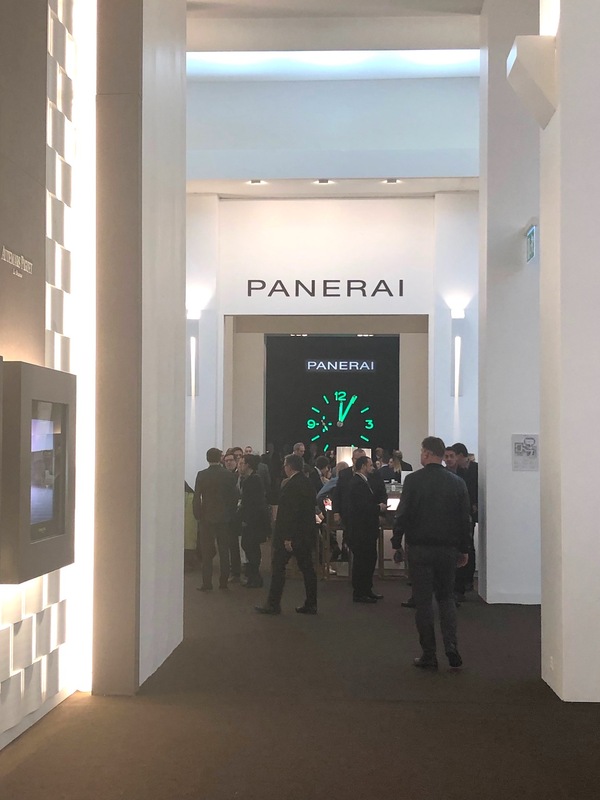 If you were in attendance at this year’s SIHH, then — as the saying goes — “if you know, you know.” For those who weren’t there, however, we take you behind the scenes for a look at what went on at the 29th annual SIHH and around Geneva from January 13-18, 2019 — the good, the bad and the ugly. 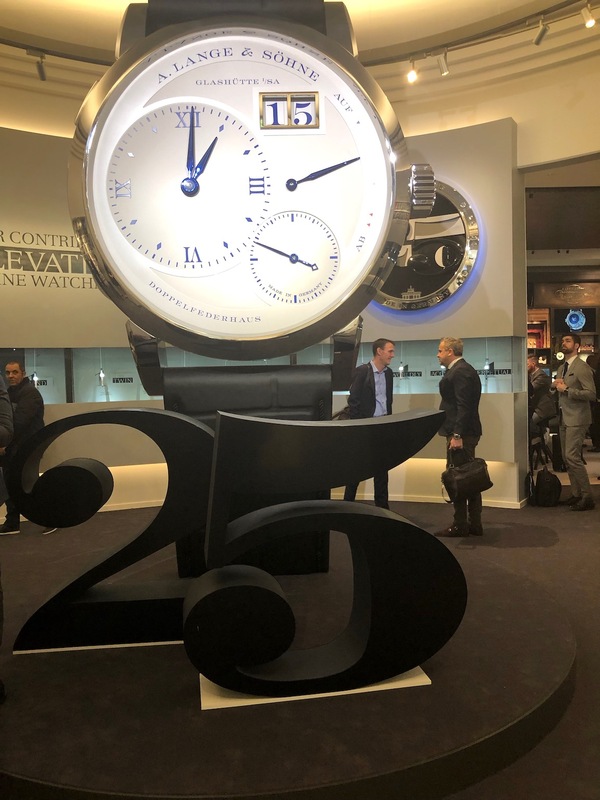 Right off the bat, I have to say that this was one of the most successful SIHH exhibitions to date in terms of organization, communication and access to the brand CEO’s and executives. From a journalistic standpoint, this was key for me. 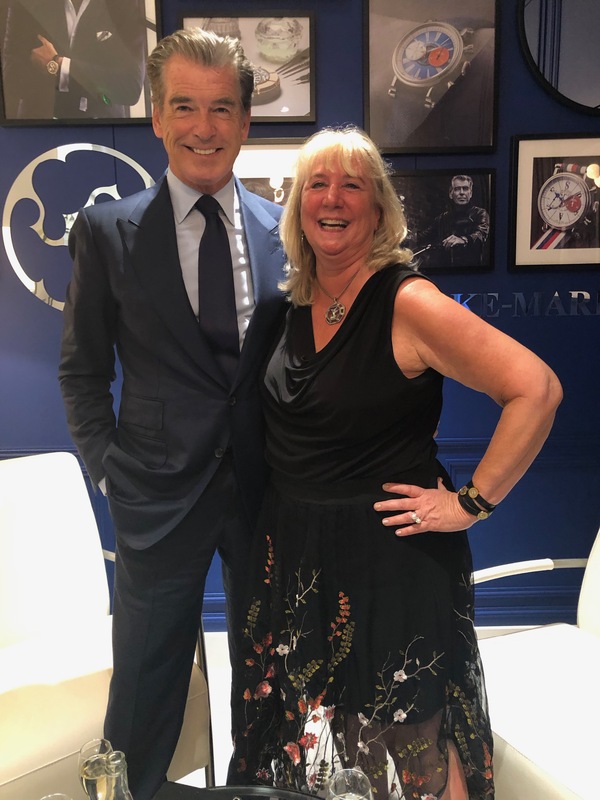 In fact, I interviewed (one-on-one) eight CEO’s and executives, as well as several celebrities, including Pierce Brosnan, who was in attendance with Speake-Marin (more on that later). 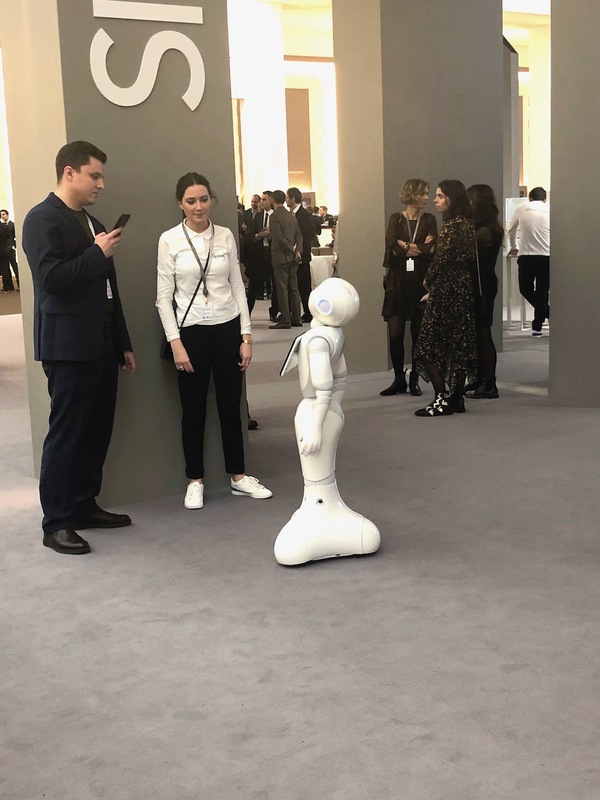 The halls were crowded with press and retailers, and in total, SIHH says more than 23,000 visitors graced the PalExpo where the show is held. Although there were rumbles about the uncertainty of the geopolitical and economic climate for 2019, everyone nonetheless enjoyed the show. In addition to crowded halls, there were some impressive discussions and presentations taking place in the auditorium, which guests pass regularly on their way in and out of the show. I was lucky enough to sit in on a few of those presentations — most geared to keep visitors in the loop about the current and future status of the watch business. There was even a LAB set up in the Fair where child-size robots interacted with visitors, and where guests could discover some of the uncanny R&D that goes on behind the scenes. As to the exhibitors, there were 35 in total, including most of the major players from the Richemont Group (A. Lange & Sohne, Cartier, Montblanc, Baume & Mercier, Piaget, Vacheron Constantin, IWC, Jaeger-LeCoultre, Panerai, and Roger Dubuis), as well as Greubel Forsey, Richard Mille, Audemars Piguet, Parmigiani Fleurier, Bovet, Girard-Perregaux, Ulysse Nardin and Hermes. In the Carre Horlogers area of the show, 17 key independent brands (including H. Moser, HYT, Hautlence, MB&F, Ressence, Speake-Marin, Armin Strom, Romain Gauthier, Urwerk, Laurent Ferrier and others) showed their newest timepieces, as well. As is customary, this year each of the large brands had newly decorated exhibition spaces. While we in the industry refer to these as booths, they are anything but a booth. In fact, most of the exhibition structures (one-level only) stretched far and wide and each had a special theme that ties in either with their newest product launches, or with their heritage and roots. Stand out spaces this year included Richard Mille, which built a veritable cld-fashioned candy store as its backdrop. 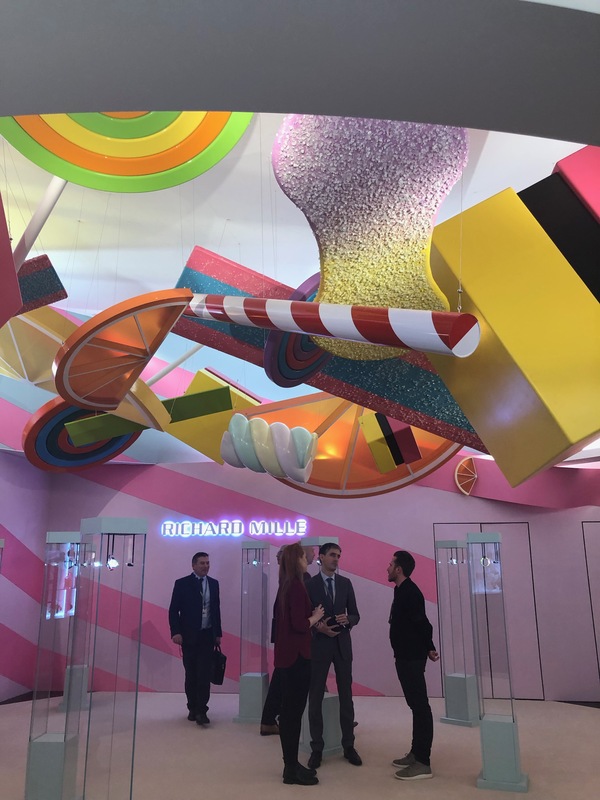 With pastel-colored lollipops hangin from the ceiling and huge glass jars filled with candy for the asking, the exhibition space made the perfect setting for its BonBon line of candy- and marshmallow-inspired timepieces. 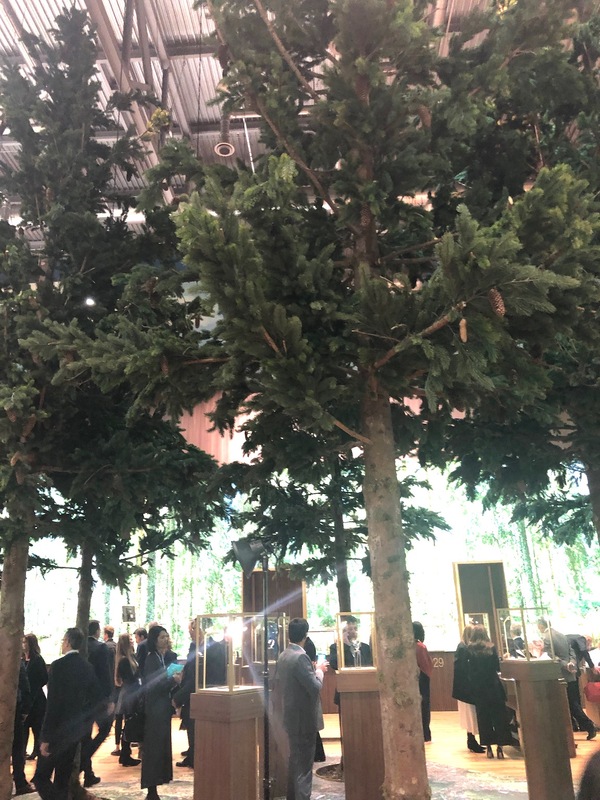 Turning to nature for inspiration, Jaeger-LeCoultre actually brought live evergreen trees in to emulate the brand’s LeSentier workshops nestled in the Jura Mountains. Amidst this natural setting, the brand had different watchmaking stations, where artisans and watchmakers demonstrated their crafts — crafts that take place daily at the brand’s incredible Manufacture. 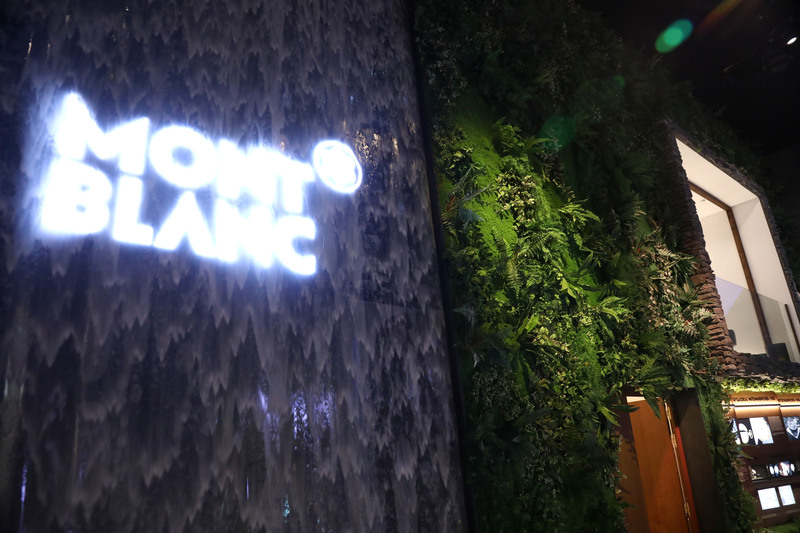 Similar to the woodsy feel of the Jaeger-LeCoultre space, Montblanc also turned to the outdoors for its setting — emulating its “mountain climbing” and adventure theme behind many of its newest watches. Here a waterfall greeted guests, a mural of the mountains and woods, and even a pond of water (that as far as I knew, as of the last day of the fair, no one had yet fallen into). Over at Piaget, the brand also emulated nature, but taking to the sunny beaches instead of the forests. With a mural of water in the background, lounge chairs set in sand with boardwalks all around, Piaget used its space to showcase its masterful glittering gold craftsmanship in shimmering beauty. 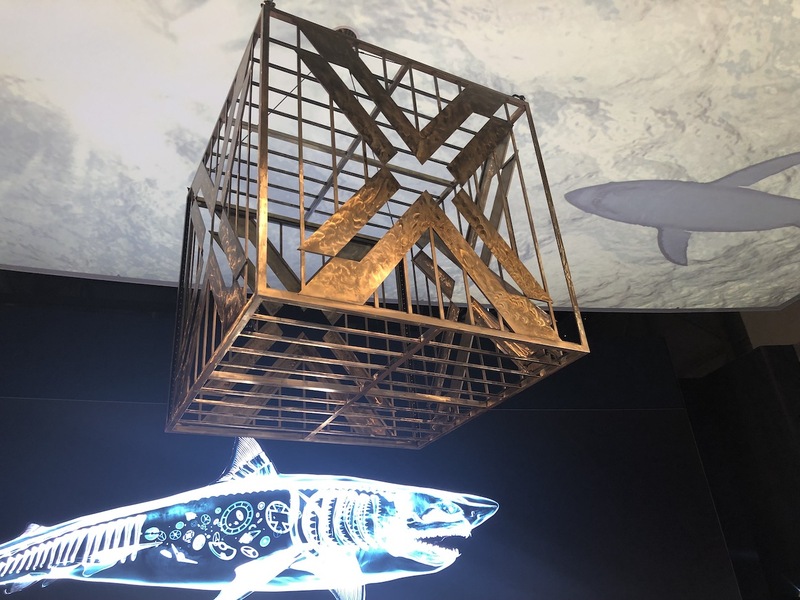 Also turning to the water theme, Ulysse Nardin brought the ocean to SIHH, complete with a (projected) shark swimming overhead and beneath (projected onto the floor) visitors. As though we were in the ocean, one could look up to see a shark tank suspended in the “water.” That same shark tank was lowered to the floor at 6:00 each evening to double as DJ booth when cocktails were served. Contrasting to these peaceful and serene exhibition spaces, other brands boasted cars, planes and mechanics. IWC, for instance, brought in a real spitfire plane that will be journeying around the world later this year. 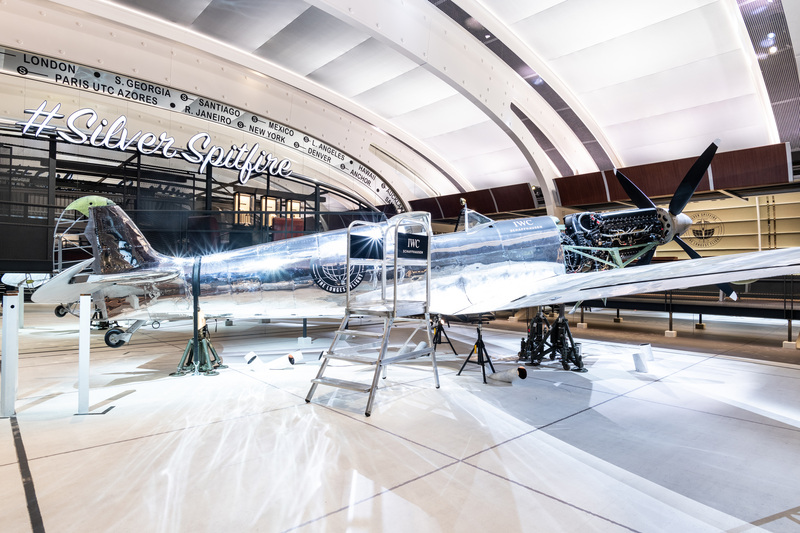 It also chocked its space with aviation-inspired props to further underscore its commitment to its Pilot’s and Top Gun watch lines — a key unveiling this year. 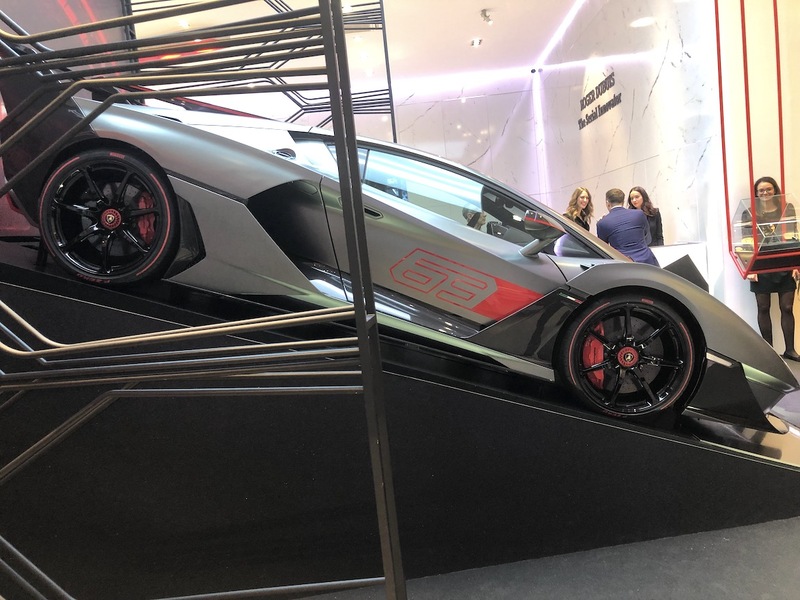 Roger Dubuis showcased a unique Lamborghini, A. Lange & Sohne featured its traditional larger than life clock, this year in the form of the brand’s 25th Anniversary watch. Some booths, including Hermes and Girard-Perregaux boasted a moon and stars theme that emulated the timepieces they were unveiling this year, and others such as Cartier and Bovet used their space to showcase their crafts and their incredible timepieces. In short, just walking the halls of the SIHH is an adventure, with something new to be spotted at every stop. This freshness keeps the show interesting year after year. The other thing that makes the show so great is the ease of working it. It is not massively big, but one can definitely put an average of 5 miles on the smart watch activity tracker each day. Additionally, food, coffee and champagne, flow freely (free being the operative word) throughout the day, and there are even several restaurants (again with free food) to take a load off at lunch time. Also, for journalists, there are strategically placed table and chairs, seating areas for impromptu meetings, and white spaces for photo and video taking. Nothing tops great friends, with Josh Shanks of Watchonista and James Lamdin of Analog Shift. Great Times. But the best thing of all about this show– and any show for that matter — is the people. There is nothing as gratifying for me, after 35 years of working in the watch industry, then seeing friends from around the world converge in one place. Despite changes in executive ranks, I can still sit down for coffee or champagne with the once-head of certain US brands that are now in different positions; I can have a simple espresso and chat with a person in a newly formed friendship, or meet someone I had only heretofore corresponded with on LinkedIn or another social media platform. My only regret is that I don’t have more time with these people, but that is what my world travel is for, or the next show. 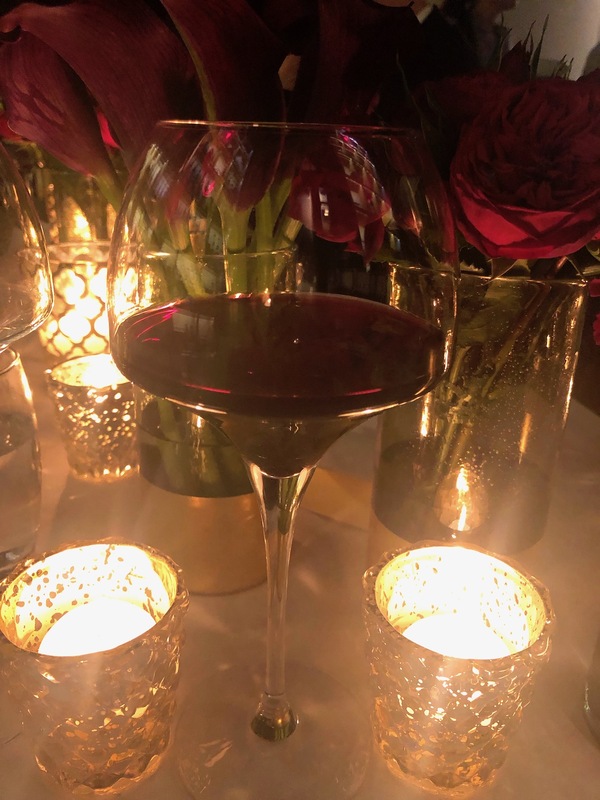 The other place to see people is — at the end of each night, after dinner — the hospitality suite that Richemont USA brands open up for journalists and retailers from America. 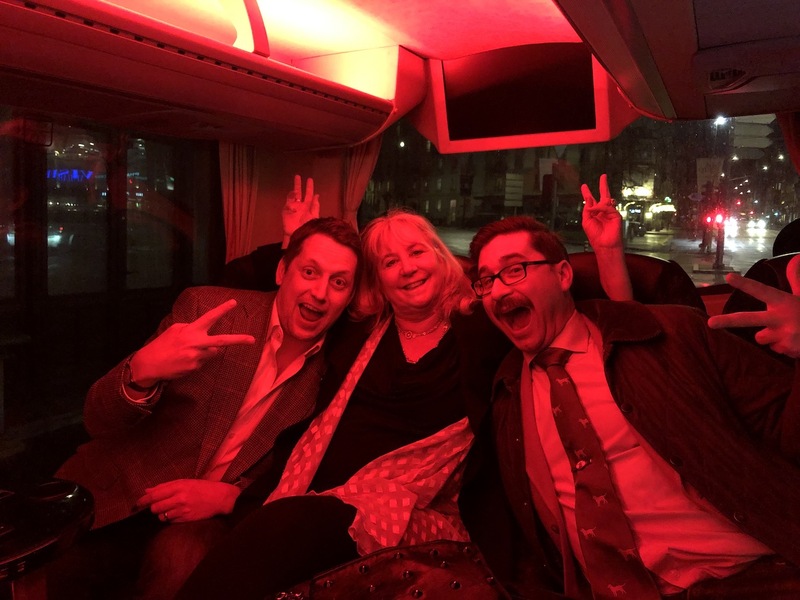 Granted, we drink too much there, but we do let loose. We meet long-time friends, new friends — both press and retailers — and just have some great talks (not all my be remembered the next day) and laughs. Somehow in Geneva, we let our guard down at night. We go out, we have fun and there is no judgement — and that is a beautiful thing. Finally, of course, there is the product. New watches galore. From diamond-adorned spectacles to incredibly complicated patented pieces and high-octane sports watches, product abounds. At the SIHH alone, I had 15 appointments a day — translating to seeing, touching, feeling and photographing hundreds of watches a day. It is a welcomed overload of the senses. If you read back a few weeks, and continue to read our coverage here at ATimelyPerspective (and at my other outlets such as Forbes.com, Elite Traveler and Monochrome, for example) you will witness our hands-on experiences in a host of articles about the new watches from SIHH that will be finding their way to wrists around the world later this year. This year Audemars Piguet chose to launch its newest collection, Code 11:59 (more coming on that soon, too). It is the year that Laurent Ferrier unveiled its first shaped case, the year that Armin Strom released a stunning sapphire cased Masterpiece One Dual Resonance watch, it is the year that some brands unveiled their first women’s watches (or gave us a sneak peek at what is coming down the road), and it is the year of so more. Some I liked; some I didn’t like — but that will all come out in my upcoming articles throughout the year. 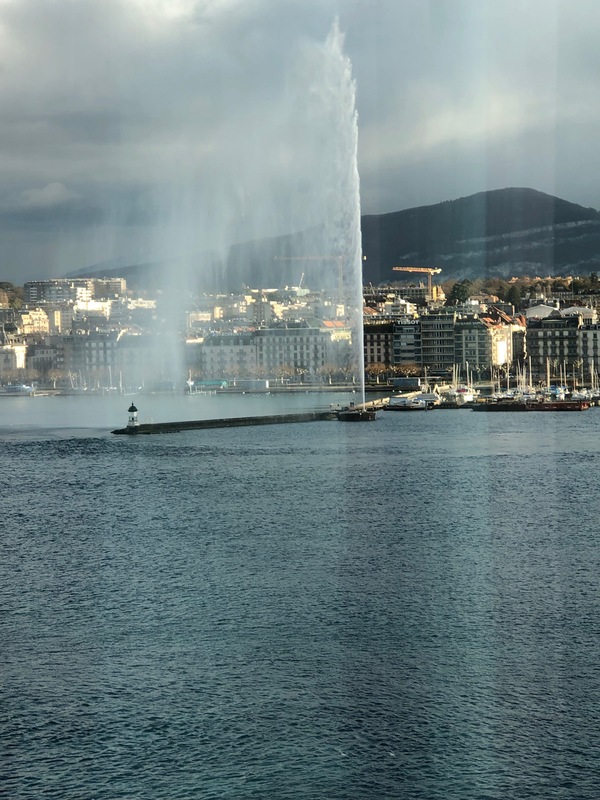 In addition to SIHH, every year, more and more brands ride the coat tails of the Salon and exhibit around the great city of Geneva. 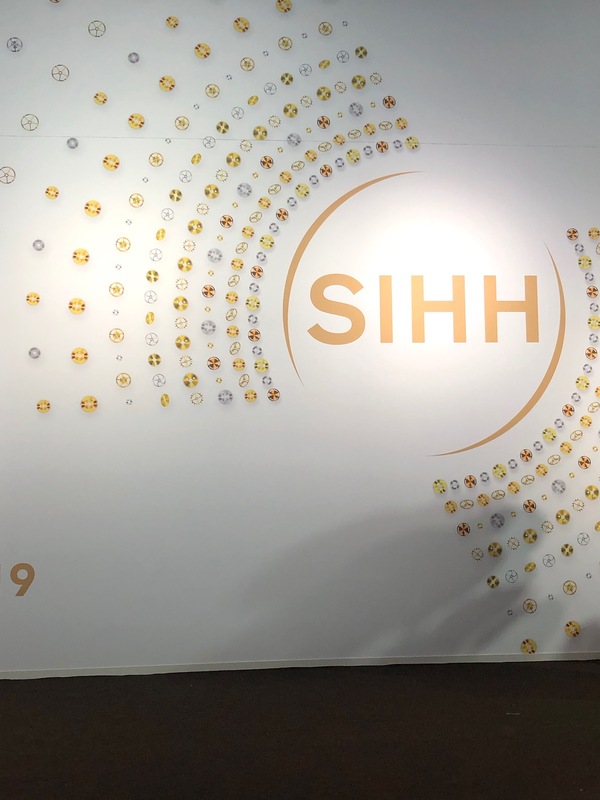 While no one really wants to talk too much about going off-site — because to a small degree, the journalists are sponsored by the SIHH brands — it has become a fact of life during this week in Geneva. In fact, this year more than two dozen brands showed their newest timepieces at small exhibition spaces, hotels or their local Geneva-based workshops or retail stores. Of course, I just couldn’t fit another 20+ brands onto my four-day roster, but I did manage to see a few on my first or last and final day in town — and I will be bringing those stories to light here, too. Lastly, I look back on this year’s SIHH as one of change and growth. Next year, the SIHH and Baselworld will align their dates in late April/early May so that we will move from one show to another with no break in between to digest the thousands of watches we will see at each show. This is the way it was done 29 years ago when SIHH first began. We would make our way from city to city, from show to show, so in a way, this is a return to the show’s roots. There is a four-year contract in place to keep the dates of the two shows in synch. Let’s see how it pans out. Oh, and for a review of the best USB keys from the show — a regular Storage Wars story I do after every show that has become somewhat of a brand favorite — read this.. Cheers. Here’s to SIHH 2019, maybe one of the best ever.